We hope all of our furiends had a good Thanksgiving. We had a nice snuggle in with mum on Thursday AM. Mum spent a long time in her jammies just hanging out with us. But then she packed up and left us! So we got no turkey, whipped cream or even left overs brought home to us. Mum went to be with her furiends, the same ones from last year. Same menu, duck roasted outside on a grill. These pics are from last year when it was nice enough to be outside and take pictures. This year was cold so mum stayed inside by the fire, snacks, dinner and drinks! Mom says it was nommy, but there wasn't anything left to bring to us! Eight people demolished the three ducks. Mum isn't sure she was in charge THEE most important part of the day, but everyone brought something that made the meal special. Plus, rather than make mum drive home, her furiends had her stay the night. So she didn't get back to us until later Friday morning. But other than to go to the library she then stayed home with us to snuggle. No shopping for her, just looking at the ads and saying there was nothing she needed to get that was worth getting up early and fighting with the crowds. Hello and welcome to the Thanksgiving Day edition of Garden Thursday. We hope that all of our furiends have a good day. We are very thankful for many things, but to mention a few: Your furiendship, a lovely home to live in, mum and the love she gives us. 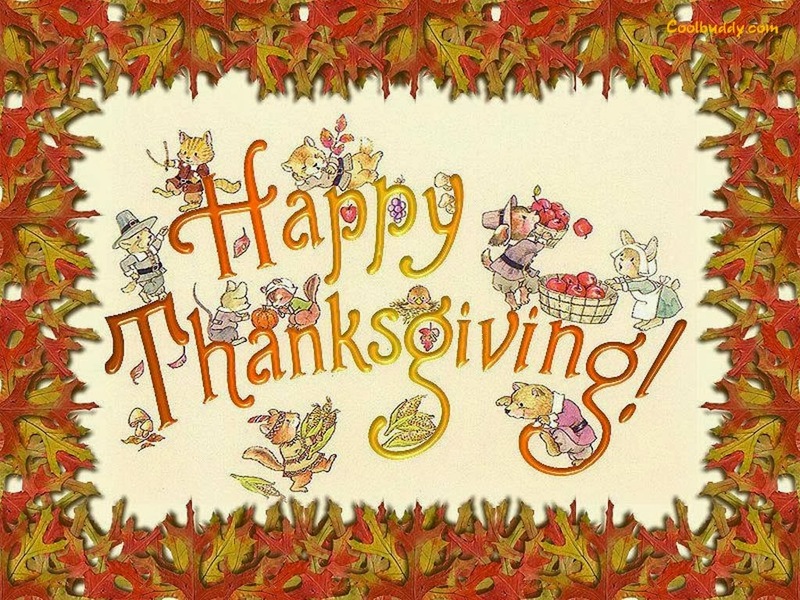 We hope you take time today to be thankful for what you have. The bird, mum won't be cooking, just eating at some furiends house today. She is just taking a supply of adult beverages for the meal. Mum is good about picking decent wine to have with the bird of the day. Ducky, paws together saying thanks last night. We have a white Thanksgiving, we had snow on Monday and it is still here. Mum says the gardening season is likely over. She didn't quite get done everything she wanted to this fall. Like one more time to use the grass eating monster. Derby looking out the back with mum, see that white stuff! Brrrrrr. The view from the front and you can see some of the mess by the road, the village hadn't come by to pick up the leaves, so when they plowed the road after the snow the leaves got dumped back in the yard. If the weather gets better they hope to get to them in the next week. This will be the last Garden Thursday for this year. We will just watch the world go by until spring when we get outside again in the garden. 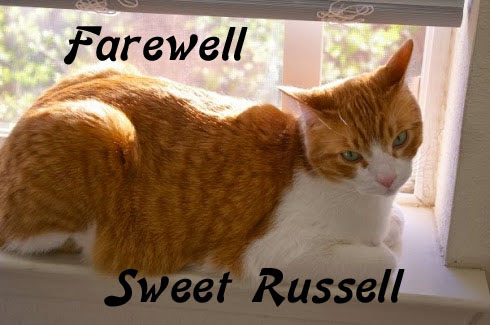 We were sad to hear that one of our furiends and gorgeous ginger, Russell, ranned off to The Bridge. If you haven't been by to leave some purrs for his family, head on over to William of Mass Destruction. See you at The Bridge someday Russell. If I want to hear the pitter patter of little feet, I will put shoes on my cat. HiYa Ducky here. What did we do to kill the sucky monster, we don't know, but the peace and quiet didn't last long. Mum checked out stuff on the web, then jumped in to the metal monster and was gone less than a furry short nap. Seems Tar-szay had it on sale, and she got the last one! She came home with this box and in just few minutes had the thing put together and ready to roll. Once around the house and this is how much more furs she picked up after she had already used the old sucky monster. We don't know what we did to kill the first one, but it sure didn't take mum long to get a replacement. The witch was dead, long live the new witch! The Pack - well they played the ViQueens and the game went into overtime, but the OT period ended up tied too, so nobody won. The backup to ARodg started the game at QB, then the backup to the backup, Mr Flynn, went into the game in the second half, and he just used to be the backup a few years ago. Mr Flynn did purrty well, he brought the team from 16 points down to tie it. Mum says a tie is like kissing your sisfur or brofur. The Broncos - playing on Sunday night, two weeks in a row.They went east and were playing Miss Millie's team, the guys name Pat. At half time, mum's fav Mr Peyton is winning and pitching a shut out.The boys named Pat made a comeback in Q3 and are now ahead. We know mum won't make it to the end of the game, but it should be an interesting end to the game. Only a few more days until Thanksgiving. Mum is happy for the short work week but she says she will be bizzy, bizzy, bizzy. Caturday - Ding, Dong, the sucking monster is deaded! Hooray! The sucking monster died! Mum didn't get all the way through cleaning today, she noticed that the monster wasn't picking up the furs and stuff we laid down. She took it apart looking for a plug, but didn't find anything! Bad news, is that she is checking out new ones. We say, just skip it. Heck you know the minute you finish, we go back and put more down. So why bother! Mum has been working hard or maybe hardly working this past weekend. She got out and clean the leaves from the rain gutters. Like the boys said, she used the scoop from the litter box. Creative lady mum is. She is even more creative with her hots measuring thing. Seems you have to keep it away from the wet, so can't just sit anywhere outside. With the patio cover gone, she had to figure out where to go with it. Then she can sit on the couch and see how hot or cold it is outside. So what to do? She amembered that she had a hummer feeder that she didn't use this year AND it had a big opening to put things inside. So mum popped it inside the feeder and put the top back on. It was more than roomy enough for the sensor. The she hung it on the fence in a corner where it shouldn't be in the way. And probably in a spot where the hummers won't be looking for food next year when they come back. Obviously she did this before all the leafs fell off the bushes! Mum still has stuff to do outside. Gotta finish getting the leaves off the grass and then use the grass eating monster one last time. One week from today. THANKSGIVING! Thanks for stopping by, Love, Virginger. 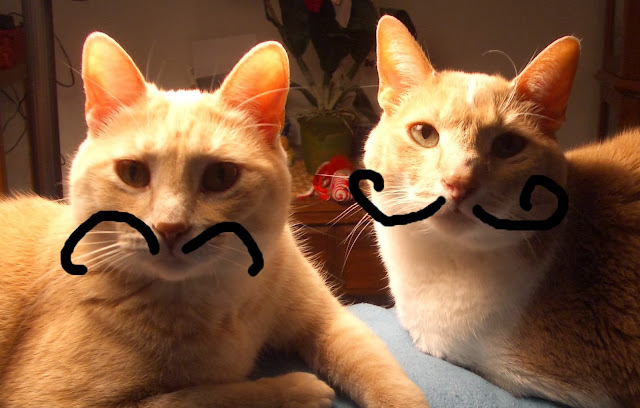 Heck, if we can have Tock-tober, then we move into MO-vember. Moving from back end to front end. When dogs leap onto your bed it's because they adore being close to you. When cats leap onto your bed it's because they adore your bed. 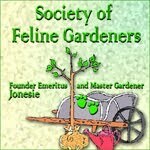 First, we hope that our kittie furiends and their beans are all OK after the nasty storms this weekend. We had rain, wind, thunderbooms but no damage here. We love mum's bed. We join her regularly to play and snooze with her. So with or without mum we like her bed! The Pack - starting their third string QB and the third different starting QB in the past three weeks, they didn't get past the Giant guys out east. Mum watched, didn't get upset or yell at the moving picture box. First three game losing streak since 2008. She doesn't expect them to have much of a season this year. Although the last time she felt this way, three years ago, that is when the went to win the Stouper Bowl. So the fact that mum is down on them, maybe that is good? The Broncos - played on Sunday night against the Chiefs, for first place in the AFC West. We know mum isn't going to get through this game. She has already nodded off twice so we are sending her to bed. Right now our fav Mr Peyton and the Bronco's are winning. HiYa Ducky here. I am about ready to have a nice nap. I had to get mum all warms up from being outside first. So I had to sit on her a while. She was bizzy doing leafy stuff outside. First she got out the big ladder and moved it all along the back and then front of the house, tossing out the leaves from the rain gutters. She found a neat tool to use to help her, the little scoop from the new litter box. It just is the right size to scoop things out of the gutter. The she got the big pile of leafs off the front porch, the snow melted a few days ago as it got a bit warmer. You can see the mess now out in the street, the village men will come along and take them away in a few days. Mum still has to do the side yard, but as she blew the leafs off, the wind would blow them back. So she gave up for today. Said she was cold and wet. So came inside, got in the hot rain room, then after that I had to sit on her a while. Derbs and I will be napping for a while. Come join us if you like! 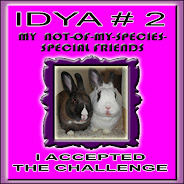 Mum discovered that this didn't publish when it should have! Hello and welcome to Garden Thursday. I had a week off since there was nothing much to report, plus we wanted to keep up our post for GJ. Mum is slowly getting stuff done outside. She still has to get rid of the leaves, but they are finally almost all down off the tree. Mum says this weekend she will be working on them. However, we had a bit of a surprize on Monday, it sort of rain/snowed and got furry cold. So this is what it looked like the next morning. Plus you can see they put back the front railing a few days before and mum says they will be by to pick up the final payment. I have come inside for the winter. It is too cold out even for me. 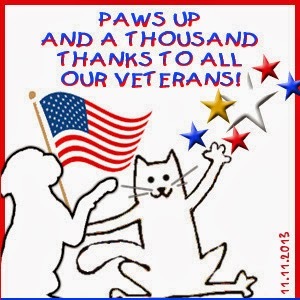 We are saluting all of the men and women who currently serve or have served our nation by being in the armed forces. They protect our freedoms and we are so thankful that they do. Mum did take it much easier on Sunday. Mostly doing the laundry and foods shopping and watching the moving picture box. The Pack - Well another game, another QB down with an injury. So they had the third string QB playing, but we is familiar with him. Scott Tolzien used to play for Bucky Badger! Mum didn't do much cheering or yelling at the box, she didn't expect them to play well. The Broncos- Mr Peyton did his usual good job leading the Bronco's to a win in Sandy Eggo. Next week they play KC the only team that still hasn't lost this season and just a game ahead of the Bronco's in the standings. Happy weekend one and all. Ours is windy as we watch the leaves blow off the tree and around the yard. We have mum outside working on getting the plants all cut down and carted off. Mum is happy that soon all of the outside work will be done. Then she has inside work since she has to work on getting the dungeon back in order, but she made a good start the other day. She took the day off from day hunting and started to organize things again. She even tossed some stuff out, even one of our old litter boxes. Plus we have to cellybrate duckies this week. Seems the rubber ducks have been put into the toy hall of fame. So at least Ducky is pleased that the ducks got some extra press. We just found out that one of our fellow Gorgeous Gingers has departed for The Bridge. 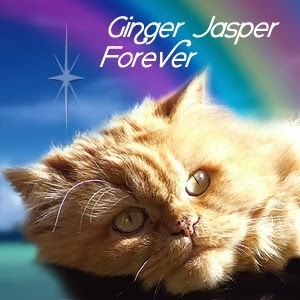 Wonderful Ginger Jasper. 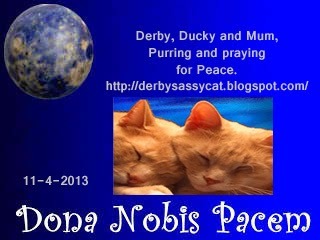 If you haven't already done so, go and leave some comforting purrs, woofs or words for his beans, Carol and Barrie. 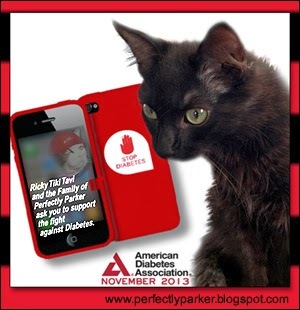 We are joining in with Ricky Tiki Tavi from Perfectly Parker to meow out that we don't like diabetes. It is nasty, humans, kitties and woofies too can have it. So let us do what we can to make this go away. We had a quiet feetsball weekend. Although that let mum get more work done around the house. She wasn't sitting on her backside watching the moving picture box. The Pack didn't play until Monday night against Da Bears! So we were more than ready for feetsball.The game got off to a bad start for The Pack as ARodg went out with a shoulder injury.No report yet as to how bad or how long he will be out. Plus they losted to Da Bears. There is no joy in Packerland today. Peyton and the Bronco's took the week off. 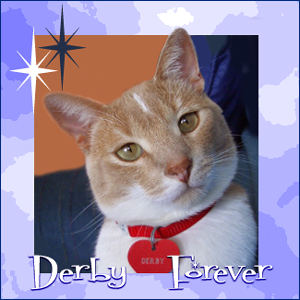 Yeah it was eight years ago today that I, Derby the Sassy Cat, first ventured out on the innerwebs and made a post. 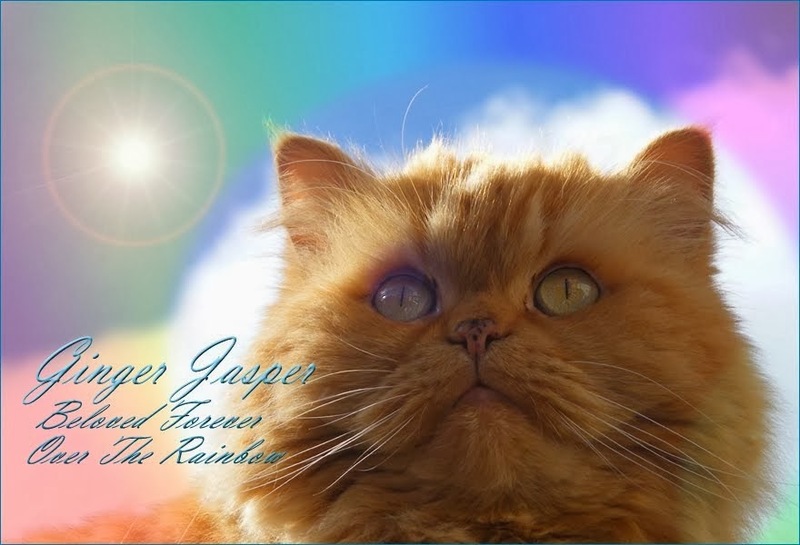 I had been inspired by Max, The PsychoKitty to open up my life to the rest of the world. It took a few weeks of find other kitties and them finding me. The Cat Blogosphere was so much smaller way back when. We could visit every blog, every day, comment, and even go back to recheck comments. There are so many more now, we can't even keep track of everyone. It has been an amazing journey and lots has happened. Ducky joined a few years ago. We have gone through the loss of our Grampie and so many of our kittie furiends running off to The Bridge. Some of our kittie furiends have also lost their beans. We cherish the friendships we have made, kittie to kittie, even some of our beans getting to know each other. No big party, just a quiet satisfaction of the camaraderie that we share. Mum is making us tired just watching her. Outside work, inside work, bizzy, bizzy bizzy. She has to learn to chill with us.